These were among the findings on the first global assessment of the state of the world’s pollinators which has been published following a week-long international meeting in the Malaysian capital Kuala Lumpur. The assessment, also the first from the new Intergovernmental Platform on Biodiversity and Ecosystem Services (IPBES), created in 2012, paints a comprehensive picture of the decline in pollinators such as bees and butterflies. Here are 11 things you need to know about the falling bee population, and why it matters. 1. Almost 90% of wild plant species and over 75% of crops we use for food depend in part on pollination by bees, butterflies and other animals. The report estimates the annual economic value of pollinators at $235-577 billion. The western honeybee is the most widespread managed pollinator in the world, producing an estimated 1.6 million tonnes of honey annually. 2. Since 1961, the volume of agricultural production reliant on pollinators has increased 300%. Crops that depend on pollinators show lower growth and stability in yield than crops that do not depend on pollinators. 3. Scientists are recording a decline in wild bees and other wild pollinators, particularly in north western Europe and North America. The number of western honeybee hives has almost doubled in the last 50 years, but Europe and North America have seen “severe declines”, says assessment co-chair Simon Potts from the University of Reading, UK. 4. Over 40% of invertebrate pollinators (bees, butterflies, midges) along with 16.5% of vertebrate pollinators (bats and birds) are threatened with global extinction. In Europe, there is evidence that 9% of bee and butterfly species are threatened – but “this is probably an underestimate,” says Potts. 5. Experts are concerned by the declines. The reasons for the fall in numbers include: intensive agriculture, pesticide use, pollution, the arrival of species from different parts of the world, disease, the use of genetically modified crops and climate change. Researchers report that in lab tests, high doses of pesticides such as neonicotinoids and pyrethroids can be lethal to pollinators. But also, mass breeding and transportation can spread diseases, while devoting vast swathes of the land to just one kind of crop creates poor habitats for pollinators. 6. There are several ways to improve life for bees and butterflies. Instead of focusing on agricultural intensification, farmers could think more about ecological intensification – that is, farm for healthy diverse ecosystems, which will also be good for farming. Creating wild corridors to connect islands of wildlife across farming landscapes will also help. Improving standards of risk assessment for pesticide use, and improve instructions for use. 7. The researchers found that indigenous knowledge can provide solutions to dwindling numbers of pollinators. IPBES has gone further than any other major scientific assessment to assess knowledge from indigenous people, industry, farmers and others, alongside the scientific knowledge. 8. The risks facing bee populations and other pollinators is just one of the many threats to Earth’s biodiversity and to the biosphere – the region of Earth where life exists. Many experts say we are losing species at mass extinction rates as a result of human pressures. In Earth’s 4.5 billion year history, there have been five previous mass extinctions. The last one, 65 million years ago, ended the reign of the dinosaurs. 9. IPBES is now working on assessments of biodiversity in Africa, Asia, the Americas and Europe. It also plans a global assessment, which will include an assessment of the state of life in the oceans. 10. 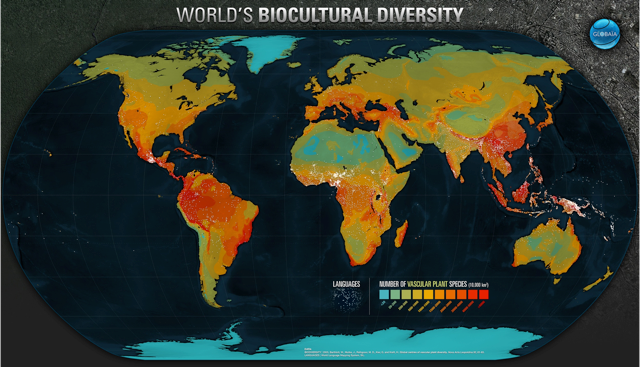 Cultural diversity and biological diversity are closely linked – Earth’s hotspots for rich species diversity tend to coincide with a high density of languages. 11. Even though IPBES’s assessments are about establishing a consensus on the current state of knowledge on a subject, and the final summaries for policymakers are negotiated by governments, governments have no obligation to act on the findings.